The key to any good BLT, as I’m sure you know, is thick cut bacon that’s hardwood smoked, so that you get a meaty, flavorful sandwich. So, why not give a Mexican twist to an American classic? I’ve used Farmland® extra thick cut hickory smoked bacon because it’s slow smoked over real hardwood for the best flavor — a point of pride, as Farmland® has spent decades perfecting their curing and smoking technique. If you can’t find the extra thick cut, you can substitute thick cut or a classic cut, but you may want to consider adding a few extra strips of bacon. If using the classic cut, I recommend the Farmland® applewood smoked bacon which gives it a slightly sweeter taste than the hickory smoked bacon. 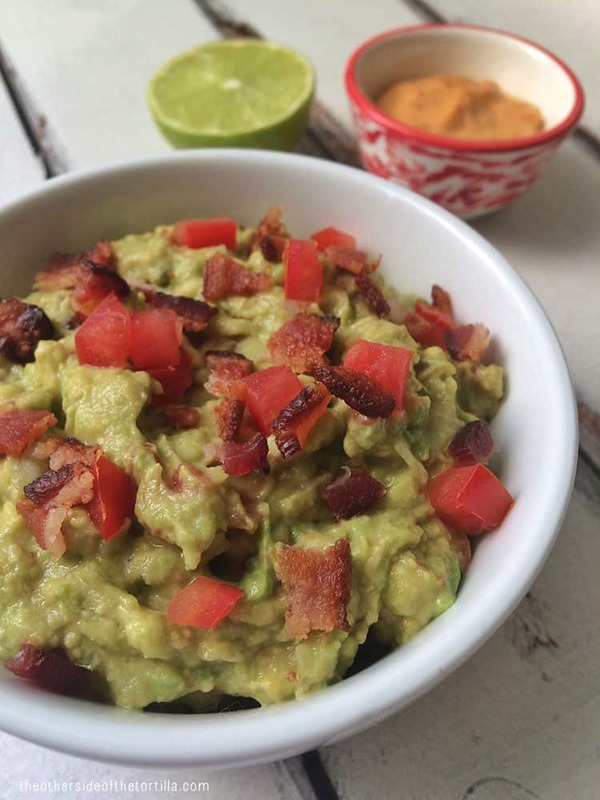 This BLT guacamole recipe is perfect for your game day party or a weekend snack for the family, and it can easily be doubled to feed a bigger crowd. 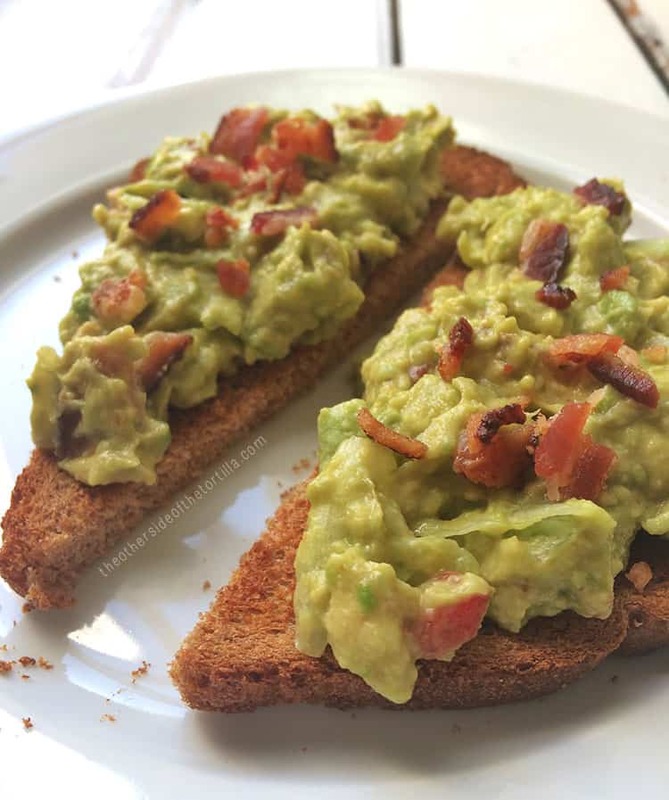 If you wanted, you could even serve this BLT guacamole as a spin on avocado toast or a taco filling! A note about the method I use to cook the bacon: I prefer to cook the bacon in the oven versus a frying pan. To do this, preheat your oven to 400 degrees F and line a baking sheet (with a raised edge, so the bacon grease doesn’t drip) or a jelly roll pan with parchment paper. Place the bacon strips on the baking sheet, leaving about one inch of room between each slice. Bake for about 15-18 minutes on the lowest oven rack, turning the baking sheet once halfway through, or until the bacon is as crisp as you like. The reason I like this method best is because the bacon stays flat, and there’s a lot less cleanup involved. Extra thick cut bacon should not be cooked in the microwave, but if you prefer to cook your bacon in a frying pan, that’s perfectly OK. Just make sure that you cook it crisp enough to crumble. Combine the classic BLT with a Mexican favorite for a guacamole recipe that's perfect for game day! Cut open avocado, scoop flesh into a bowl and coarsely mash with a fork. Add juice of 1 lime, salt and chipotle mayo, and lightly mash to incorporate. Save about 1 tablespoon each of diced tomato and crumbled bacon for garnish. Fold in the remaining crumbled bacon, diced tomato, shredded iceberg lettuce and finely diced white onion. Taste-test before adding additional salt. This guacamole can be eaten with chips for dipping, served atop a tostada, or spread on toast for a different take on avocado toast. Great idea for brunch! Love it!